Pteropods, which live in all the world’s oceans, are tiny cousins of the snail that spend their lives swimming in open water and serving as a primary food source for larger marine life, including salmon, sharks, and whales. With their delicate shells, pteropods are also in peril from increases in ocean acidity, said biologist Amy Maas, a champion for pteropods. The changing ocean chemistry caused by burning fossil fuels is reducing the mineral that pteropods use to build their shells, causing slower shell growth and rendering them weak and fragile. 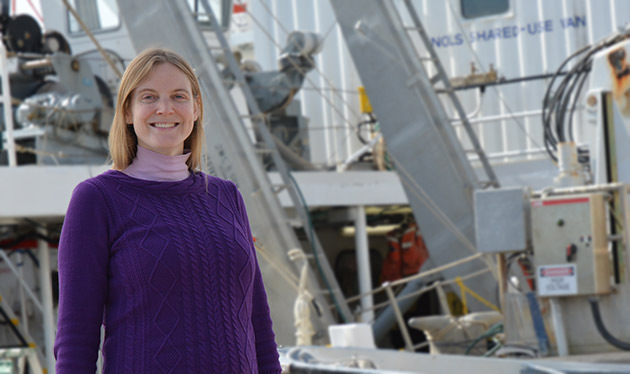 Maas, 30, who joined BIOS staff this month, anticipates that her pteropod work—started as a doctoral student and continued at Woods Hole Oceanographic Institution (WHOI) —will expand to include other varieties of zooplankton that live in the open ocean. Still, Maas said she is delighted by the diversity of pteropods in Bermudian waters, and doesn’t expect to lose her nickname—the Pteropod Lady—anytime soon. What resonated with you about working at BIOS? What is most appealing to me about BIOS is the open-ocean and biological oceanography accessibility in Bermuda. I’ve done much of my work with zooplankton in open oceans in faraway, hard-to-reach places, like Antarctica. So when I was thinking about where I wanted to go next, I was worried about having to switch gears—that I would need to be more coastal, simply because the coast is easier to reach. At BIOS I don’t have to do that. I get to continue exploring the questions that interest me. I study how marine life function at the extremes of environmental variables, such as very high—or low—oxygen, carbon dioxide and temperature levels, which are all variables that can change drastically as you traverse from the ocean surface to deep water. This lead to my studies on how animals like pteropods and other zooplankton thrive within their environment. These animals are diel vertical migratory, which means they spend their days moving from a lit, well-oxygenated place near the sea surface to a cold, dark, less-oxygenated place to avoid predators. Animals in the open ocean have no place to hide. In the daytime, the light is on; there are no trees to hide behind and no burrows to crawl in. To hide from predators they have to go someplace, and in the open ocean the only place they can go is down. At nightfall, they go all the way up again. The distance they cover on their journey is remarkable. We’re talking a teeny-tiny critter, no bigger than 1/10 of an inch, swimming almost a quarter of a mile until they get to a point where predators can’t see them. But there’s not a lot of food for them to eat down there; it’s not the ideal habitat. So every night, when the sun sets, they swim all the way back up so that they can have a plankton feeding frenzy near the surface. They are great for my work because the waters around Bermuda have a diversity of pteropods. Their lifestyles are different from the more well-studied cold-water species, so they provide a great comparison. It was never my intention to be ‘the Pteropod Lady’ but right now there is a huge interest in pteropods from the scientific community because they are a sentinel of ocean acidification and climate change. And, truth be told, I love them to death. They are not the only invertebrate I love, but they are my favorite. People create photography, sculpture, and ceramics exhibits about pteropods, and give them poetic names like sea butterfly and sea angel. Why the affection? Besides being beautiful, and a major food source for marine life, pteropods are of high interest as the proverbial canary in the coalmine. We have a lot of evidence that their delicate shells respond very quickly to the acidification in the water. Much of that work has actually been done in the Polar Regions because acidification is occurring more rapidly there. But the diversity of pteropods at Bermuda is greater, and because they are not the most abundant and they don’t have the highest biomass, they have been overlooked for awhile. Ocean acidification is refocusing our attention on them, and there is so much basic information, basic biology, that we still don’t know about these animals. It sounds like you will hang on to your ‘Pteropod Lady’ title. Up to this point pteropods have been very good for the ocean acidification question. But there are a lot of other open ocean animals living near BIOS that may be even more appropriate. I’m hoping to do some more community ecology; more research on other species that use diel vertical migration. At WHOI, I worked with squid and work with little anemones. It’s finding the animals that most appropriately address my research questions. I have to dig in at BIOS and find out what will be best. I’ll probably start with pteropods because I have traction with them. So, yes, I’ll probably be ‘the Pteropod Lady’ for quite awhile. Your husband (biologist Leocadio Blanco-Bercial) is also a new staff scientist at BIOS. How does his research intersect with yours? My work on pteropods tends to be figuring out who lives where, what are they doing, and how they do it. Leo deals with the genetics side of things. His job is figuring out who are they, or in other words, what is their identity. We met on a boat in 2011. I had started my position at WHOI on August 1st. Four days later I stepped on to the WHOI-operated vessel Oceanus, and I met Leo on that boat. It was like going from chrysalis to butterfly very, very fast; I had just finished my doctorate degree, and then I found my future husband. A lot of our relationship began by coming up with a project looking at pteropods in the Atlantic and Pacific oceans. Right now those are considered the same species, even though ocean basins separate them. I was looking at their different physiological responses to the same level of stress, because the ocean basins are different ecologically. Leo suggested that we look at their genetic similarities, because there are a lot of animals that, by their shape, look like they are the same species. But genetically they are not. Within the first year of meeting we had co-published one paper and we continue to collaborate. We are always chatting with each other about ideas. We say to each other, ‘well, that’s stupid.’ Or we say, ‘hey, I really like that!’ I’m afraid the dinner conversation is often very scientific. You grew up in Ohio. How did you end up with a career studying marine life? Science was not my intended path. I was going to be a librarian. I am the first doctor in my family; I didn’t have the family culture of thinking that science is what you do with your life. Even when I started pursuing my graduate work, I just wanted to get a master’s in biology. I didn’t intend to do anything marine. But in my first semester I had a biological oceanography class, and when the instructors started talking about phytoplankton and zooplankton I was like ‘oh, this is so cool!’ Then they took me to Antarctica. Then they put me on a boat. And it was love. To learn more about Dr. Maas' research, visit her webpage. 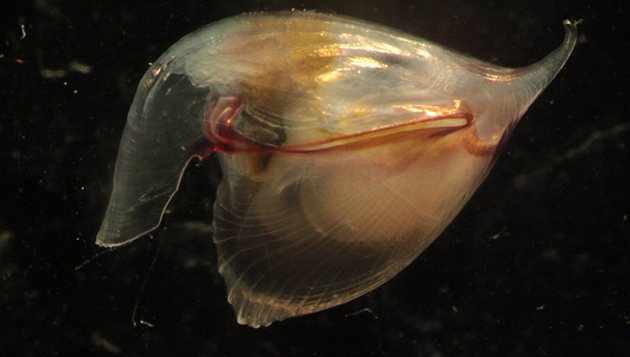 Read more about pteropods at Oceanus Magazine. Fragile Beauty: The Art & Science of Sea Butterflies sculpture display.